The Peterborough Unitarian Universalist Church offers an inviting and inclusive spiritual home that is personally meaningful and draws from many faith traditions. We live a liberal faith following the Seven UU Principles. We are a Welcoming Congregation, offering an open and accepting refuge for the LGBTQ community. We are a Green Sanctuary, which means we keep our carbon footprint as light as possible and recycle big time. Your first time? Get to know us a little better! Find out who is currently volunteering to do what. Get to know these four fabulous ladies, and Paul, too. Not shown, Paul Barnes, Custodian. The Agile Aging group will meet again at Anne Huberman’s Thursday, April 25th, at 2 p.m. Anne lives in The Village on TimberPond off of Powersbridge Road. as a way of better situating ourselves in compassion, authenticity, and vulnerability for interpersonal listening circles and dialogues. There are 20 slots total in the workshop with Leaf Seligman, and we still have a few openings. The workshop will be held on April 29, 7:00 pm on the stage in Parish Hall. If this sounds of interest to you, please respond to Morgan Cooper atcoopfam1004@comcast.net. There is no cost for the workshop, but in order to adequately compensate Leaf for her time and energy, we are asking that participants make a small donation if they are able ($10 suggested). On May 11, Tony Brinsdon will present a "Spirit of Romance" piano concert in the Parish Hall. Take this opportunity to hear a piano concert by our own Tony Brinsdon. He will introduce, comment on and play selections by Schubert, Schumann, Chopin, Brahms and Liszt. May 11th at 3:00 p.m. in the PUUC Sanctuary. Reception with light refreshments to follow concert. $20. Open to all. Proceeds benefit the work and operations of PUUC. Class begins immediately following the tour, in the Carll House meeting space, lasting until approx. 2:30. Feel free to bring a lunch to eat during the class! Are you considering joining the Peterborough Unitarian Universalist Church as an official member? Do you have questions you want to ask in order to help you discern whether or not you are ready? Are you a member who wants a "refresher course"? This class is open to all, but especially those who are new to our congregation and wanting to learn more about us. Begin with a tour of our beautiful and historic property by Julie Flood Page (open to all, but limited space so please sign up!) and after the tour, a class with Rev. 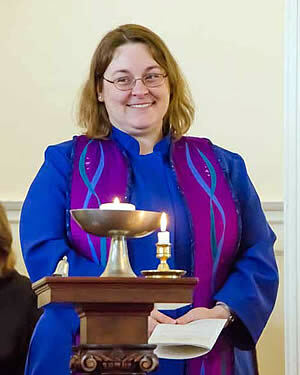 Diana where you can learn more about both Unitarian Universalism as a faith, and this congregation in particular. Please email Rev. Diana at diana.mclean@uupeterborough.org to sign up no later than Sunday, May 26th. 1st Thursday of each month, beginning Sept. 2018, 6:30-7:45 p.m.
Reverend Diana McLean welcomes you to worship at the Peterborough Unitarian Universalist Church every Sunday, September through the second week of June, at 10:15 am. Accessibility parking and access at the back of the church. Childcare always available. There are many ways to show your support for the work here at the Peterborough Unitarian Universalist Church. Here's just one of them. Shop online at major retailers and a % goes to the church.